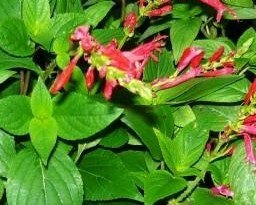 Pineapple Sage - Interesting sage variety has long slender green leaves with a fruity scent and flavor. Use in fruit punches, iced tea, salads, and jams. Long bright red flower spikes when in bloom attract butterflies and hummingbirds to the garden. Plant can grow rather tall, pinch back to keep bushy and compact. Warm weather perennial zones 9-10 can be overwintered indoors with plenty of light. Live starter plant in 3 inch container.